The Royal EZ system is a revolutionary tool that converts any conventional chair into an assisted living chair, enabling a caregiver to gently move a seated person to and from the dining table easily and safely. The Royal EZ mounts casters onto a suspended leverage bar, which is fastened to the chair’s front legs. The casters are fastened to the chair’s rear legs. Once the foot pedal is depressed, the suspended casters contact the floor, lifting the front legs of the chair ever so slightly. The chair can now be moved forwards or backwards with minimal effort. When the foot pedal is released, the casters lose contact with the floor, and the chair is once again firmly positioned. Why the Titan Swivel is the ideal assisted living chair? When we designed the Titan Swivel chair, we put the caregivers first. We looked at caregiver needs and placed a higher value on the chair’s function instead of just its form. Anyone can design yet another pretty chair. 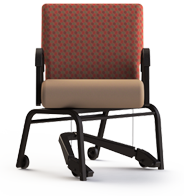 What sets the Titan Swivel apart from other assisted living chairs comes down to 3 things: it moves, it swivels, and it locks. Read More Why the Titan Swivel is the ideal assisted living chair? All Titan chairs include a luxuriously upholstered seat and back, enhancing the look and feel of today’s senior care homes. What sets apart the Titan chair from other care home chairs is its ability to provide caregivers with mobility options. Caregivers appreciate the ease with which Titan chair enables them to move a seated person to and from the table. The Titan Swivel combines elegance, durability, safety, and mobility to bring you a solution that finally makes it possible both for caregivers to easily transport a person and for that person to experience increased independence and self-esteem. The Titan Swivel is perfect for people using a walker or rollator, extending their independence by allowing them to seat themselves. With the seat rotated 90° from the table, a person using a walker can come along side the chair, hold onto the arms of the chair to gain stability, and gently lower themselves onto the chair. Once seated, the seat can be rotated back into alignment with the table, at which time a caregiver can move them forward to the table using the Royal EZ component of the chair. How does a caregiver help a person with a walker sit at a table? Watch it in action: Read More How does a caregiver help a person with a walker sit at a table?